I visited Filoli in early November to interview Hallie Schmidt for a story that appeared in the spring 2017 issue of Pacific Horticulture. 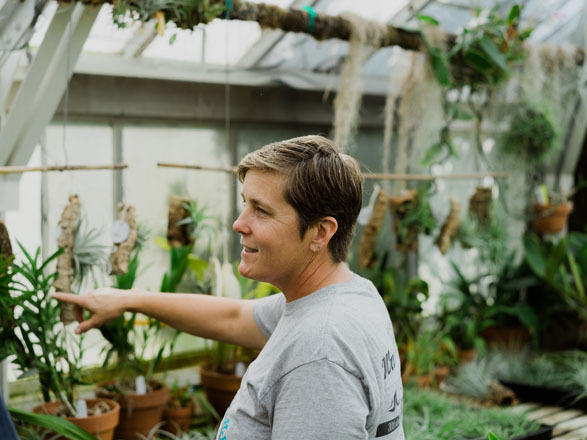 I couldn’t help but slip in this short conversation with Kelly Osborn, lead gardener for Filoli’s greenhouse and propagation operation. Kelly has worked at Filoli for nearly 23 years. She came to the garden first as a local high school student on a horticulture class field trip. On first walking through the garden she envisioned it as a place she would like to work. Kelly joined the Filoli team as an intern and has since held all of the gardener positions in the greenhouse section. On any given visit to Filoli, the garden is a riot of color provided by bedding annuals and bulbs, rotating outdoor and indoor container plantings, and cut flower arrangements; ephemeral effects that change from season to season and year to year. Much of this plant material is grown on in the greenhouses and nursery yard before it is displayed in the garden. So, Kelly is busy: “I always say the difference between being a gardener and being in the greenhouse is as a gardener you do one thing for two weeks—being in the greenhouse you do ten things in one day.” As we walk through the garden toward the greenhouses, Kelly is indeed stopped multiple times by gardeners and volunteers in need of her assistance as they carry out their tasks. Standing in the Propagation Greenhouse, Kelly describes challenges posed by efforts to propagate authentic plant material for Filoli’s historic gardens. It can take many attempts to find a successful method. The greenhouse team has been trying to create a nursery stock of Taxus baccata ‘Fastigiata’ to replace old plants that are dying in the garden. 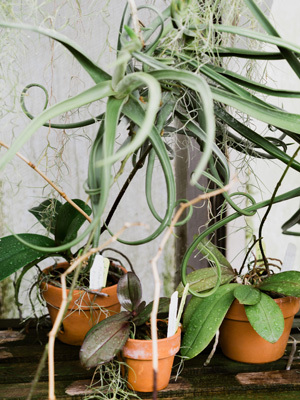 For two years they tried different cutting treatments without success, until they began growing the cuttings on in clay pots instead of plastic—the additional drainage capacity of the clay pots seems to be the trick. Each fall the greenhouse team keeps busy planting thousands of bulbs in containers, including daffodils, tulips, and hyacinths. 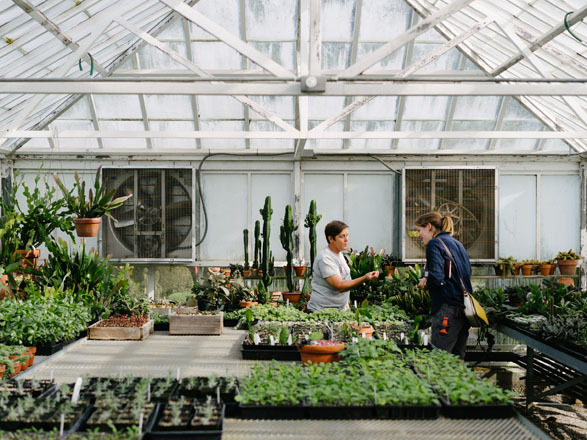 By early January when bulb planting is finished they move on to a yearly work spree in the Tropical Greenhouse. Mid-winter mornings are cold, the days are short and, if we’re lucky, we get rain. 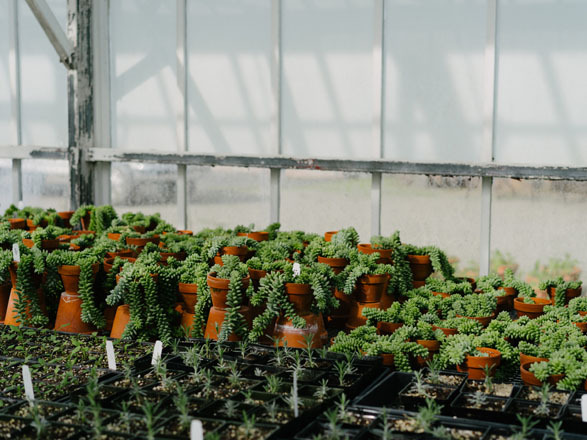 But Kelly spends her days in this quiet warm greenhouse filled with lush growth and diffuse light; an ideal spot to spend a winter before the madness of spring begins again.